Today a little thing happened. 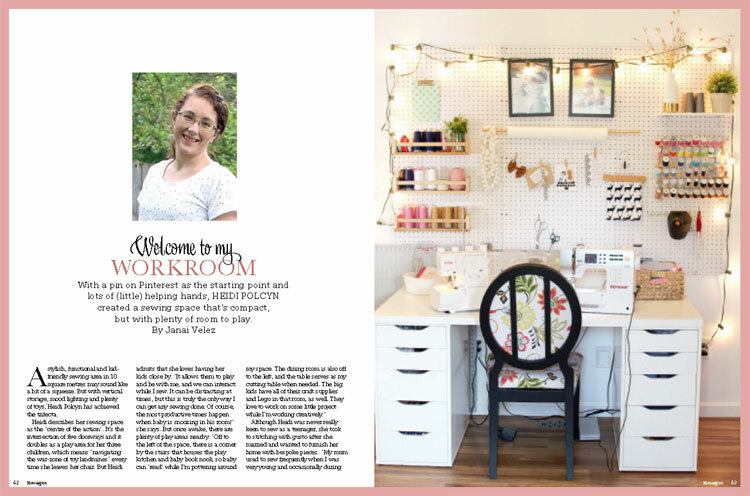 My sewing space was featured in this month's Australian magazine publication 'Homespun'. This magazine can be found in print in Australia only, from what I understand, but can be found online in various locations such as Amazon, Zinio, & Barnes & Noble. There are options to subscribe for the whole year or purchase only the current issue through the online resources as well. I am so honored and blown away to have been asked to be featured in this issue! I was given permission to publish the article here. It's a little surreal to see my space showcased in magazine format! 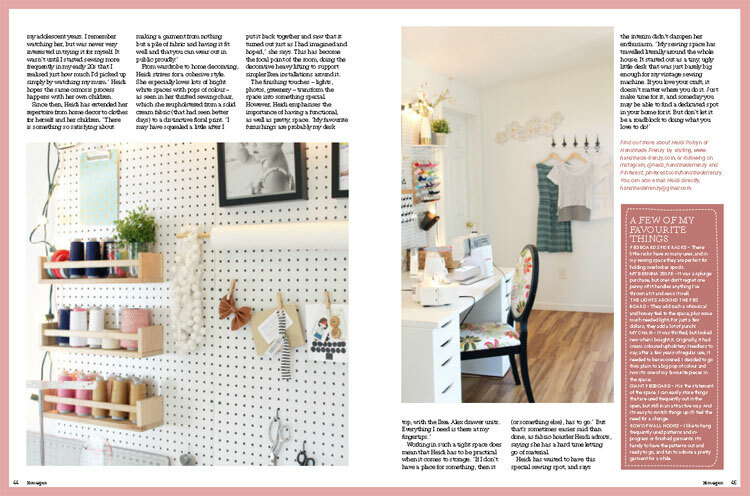 "A stylish, functional and kid-friendly sewing area in 10 square metres may sound like a bit of a squeeze. But with vertical storage, mood lighting and plenty of toys, Heidi Polcyn has achieved the trifecta. Heidi describes her sewing space as the "centre of the action". It's the intersection of five doorways and it doubles as a play area for her three children, which means "navigating the war-zone of toy landmines" every time she leaves her chair. But Heidi admits that she loves having her kids close by. "It allows them to play and be with me, and we can interact while I sew. It can be distracting at times, but this is truly the only way I can get any sewing done. Of course, the most productive times happen when baby is snoozing in his room!" she says. But once awake, there are plenty of play areas nearby. "off to the left of the space, there is a corner by the stairs that houses the play kitchen and baby book nook, so baby can 'read' while I'm pottering around my space. The dining room is also off to the left, and the table serves as my cutting table when needed. The big kids have all of their craft supplies and Lego in that room, as well. They love to work on some little project while I'm working creatively." --my adolescent years. I remember watching her, but was never very interested in trying it for myself. It wasn't until I started sewing more frequently in my early 20s that I realised just how much I'd picked up simply by watching my mum." Heidi hopes the same osmosis process happens with her own children. Since then, Heidi has extended her repertoire from home decor to clothes for herself and her children. "There is something so satisfying about making a garment from nothing but a pile of fabric and having it fit well and that you can wear out in public proudly." From wardrobe to home decorating, Heidi strives for a cohesive style. She especially loves lots of bright white spaces with pops of colour - as seen in her thrifted sewing chair, which she reupholstered from a solid cream fabric (that had seen better days) to a distinctive floral print. "I may have squealed a little after I put it back together and saw that it turned out just as I had imagined and hoped," she says. This has become the focal point of the room, doing the decorative heavy lifting to support simpler Ikea installations around it. The finishing touches - lights, photos, greenery - transform the space into something special. However, Heidi emphasises the importance of having a functional, as well as pretty, space. "My favourite furnishings are probably my desk top, with the Ikea Alex drawer units. Everything I need is there at my fingertips." Working in such a tight space does mean that Heidi has to be practical when I comes to storage. "If I don't have a place for something, then it (or something else), has to go." But that's sometimes easier said than done, as fabric-hoarder Heidi admits, saying she has a hard time letting go of material. Heidi has waited to have this special sewing spot, and says the interim didn't dampen her enthusiasm. "My sewing space has travelled literally around the whole house. It started out as a tiny, ugly little desk that was just barely big enough for my vintage sewing machine. If you love your craft. it doesn't matter where you do it. Just make time for it, and someday you may be able to find a dedicated spot in your home for it. But don't let it be a roadblock to doing what you love to do!" MY BERNINA 305PE - It was a splurge purchase, but one I don't regret one penny of! It handles anything I've thrown at it and sews it well. THE LIGHTS AROUND THE PEG BOARD - They add such a whimsical and homey feel to the space, plus some much needed light. For just a few dollars, they add a lot of punch! MY CHAIR - It was thrifted, but looked new when I bought it. Originally, it had cream coloured upholstery. Needless to say, after a few years of regular use, it needed to be recovered. I decided to go from plain to a big pop of colour and now it's one of my favourite pieces in the space. GIANT PEGBOARD - It is the statement of the space. I can easily store things that are used frequently out in the open, but still in an attractive way. And it's easy to switch things up if I feel the need for a change. ROW OF WALL HOOKS - I like to hang frequently used patterns and in-progress or finished garments. It's handy to have the patterns out and ready to go, and fun to admire a pretty garment for a while. 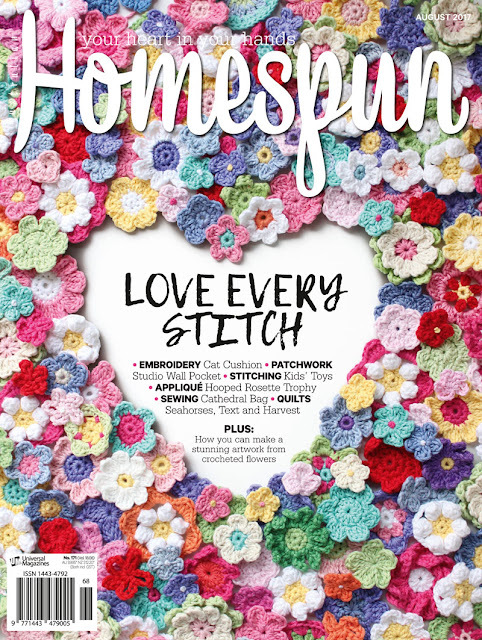 If you are interested in finding the current month's issue, look for this gorgeous crochet cover! 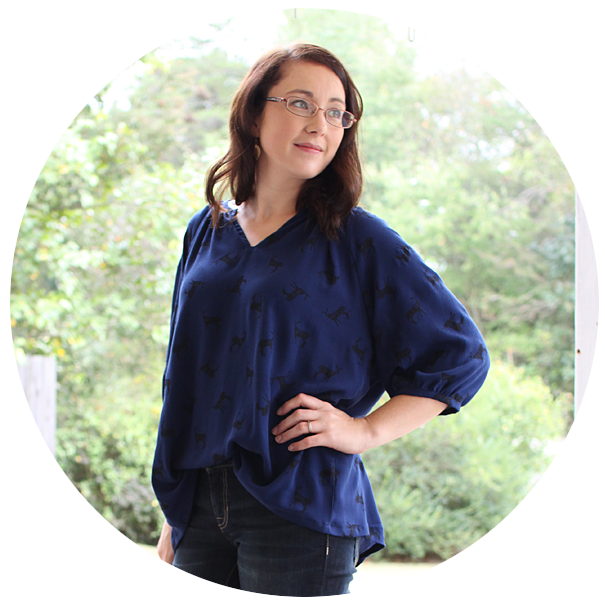 I hope you enjoyed reading more about my sewing space! If you have any questions for me, don't hesitate to email me directly, or leave a comment below and I will reply. I'd love to hear from you!